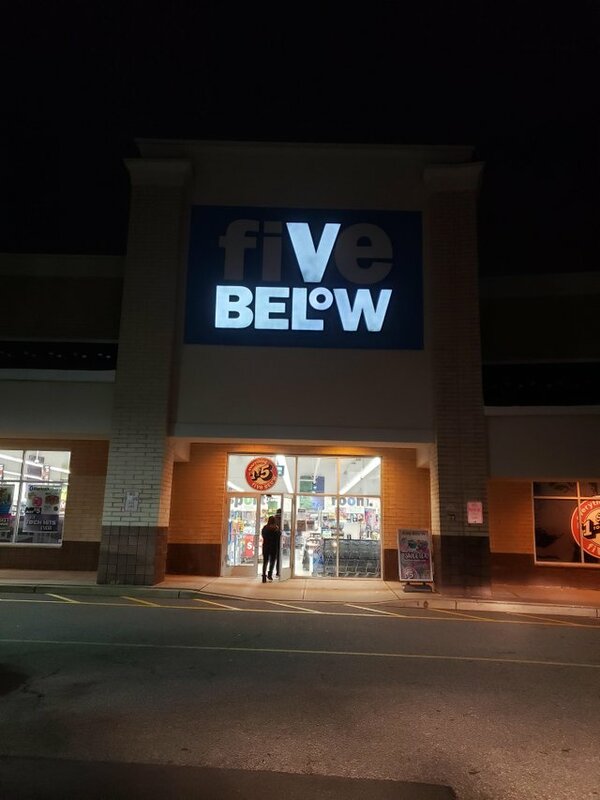 Even with three letters not illuminated, this sign is still accurate! Interested in cutting carbs? Throw out that submarine roll, or hoagie roll as they say in Haddon Township, New Jersey, home of Elsie's, where they will make a real nice dill for you and put your Italian cold cuts on a giant pickle. So you asked for a tattoo reading " 'It's my life-' Jon Bon Jovi" and this is what you get...the redacted version. 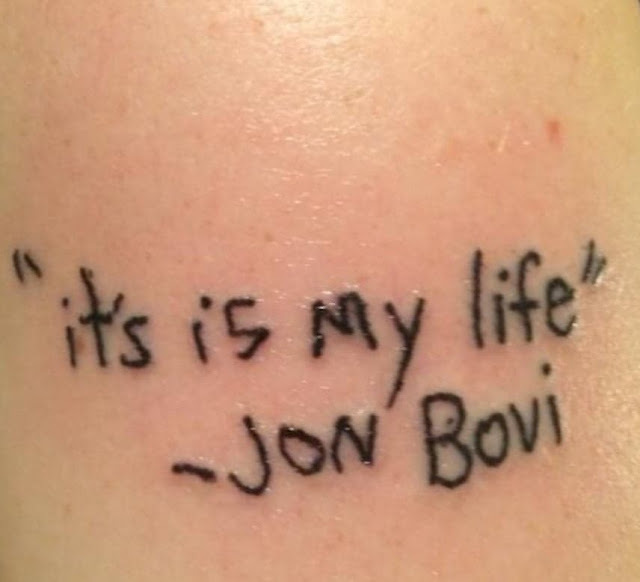 At least the prison tattoist included the apostrophe in "it's." 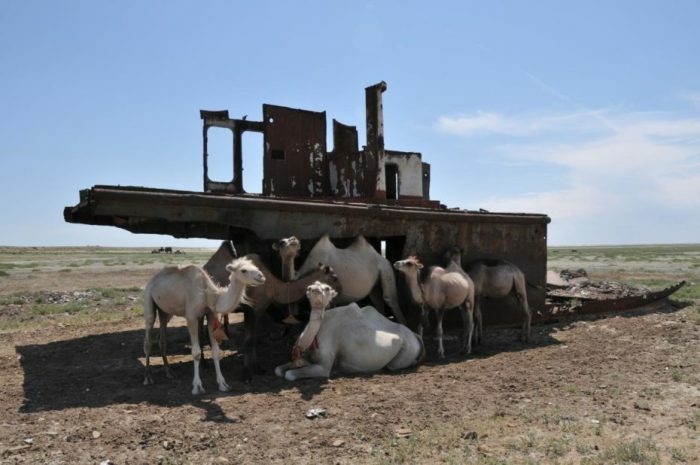 There are all these abandoned vessels now being used for shade by camels in what's left of the Aral Sea, a lake between Kazakhstan and Uzbekistan that saw all its water diverted away to the Ferghana Valley for crop irrigation. It's a huge disaster that leaves the Sea looking like a bathtub that was drained, leaving all the floating toys sitting around forlorn. You have heard of those small towns where they say they roll up the sidewalks at 9 PM. 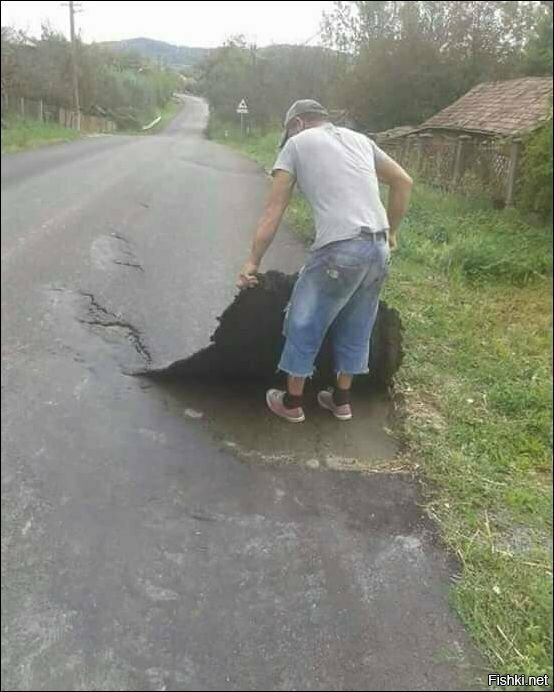 Here's a place where they roll up the whole road! You have to stay! 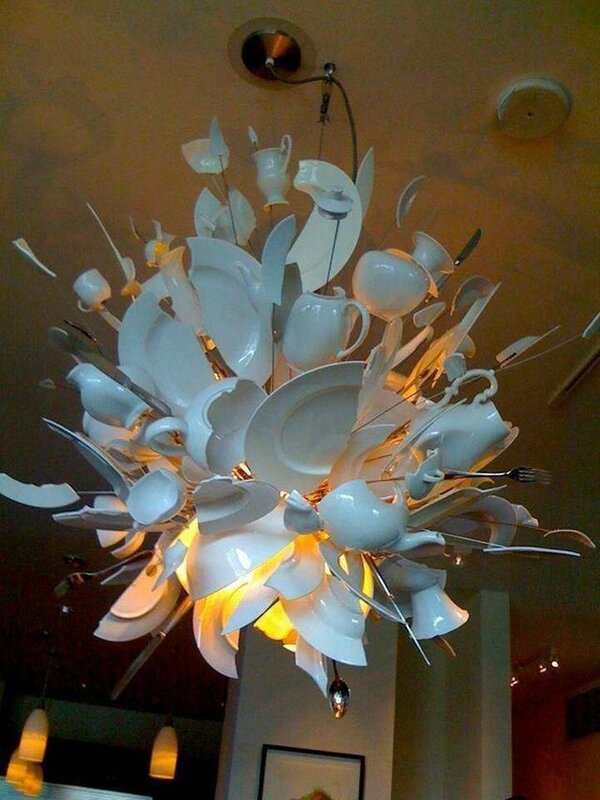 What a great idea for a kitchen candelabra! Peggy has been watching a PBS show called "Mrs Wilson." Nothing could better demonstrate the difference between her cultural interests in mine better that, having very little to occupy what there is of my mind, I determined to find out the name of the actress who played Mrs Wilson on the old "Dennis The Menace" show. 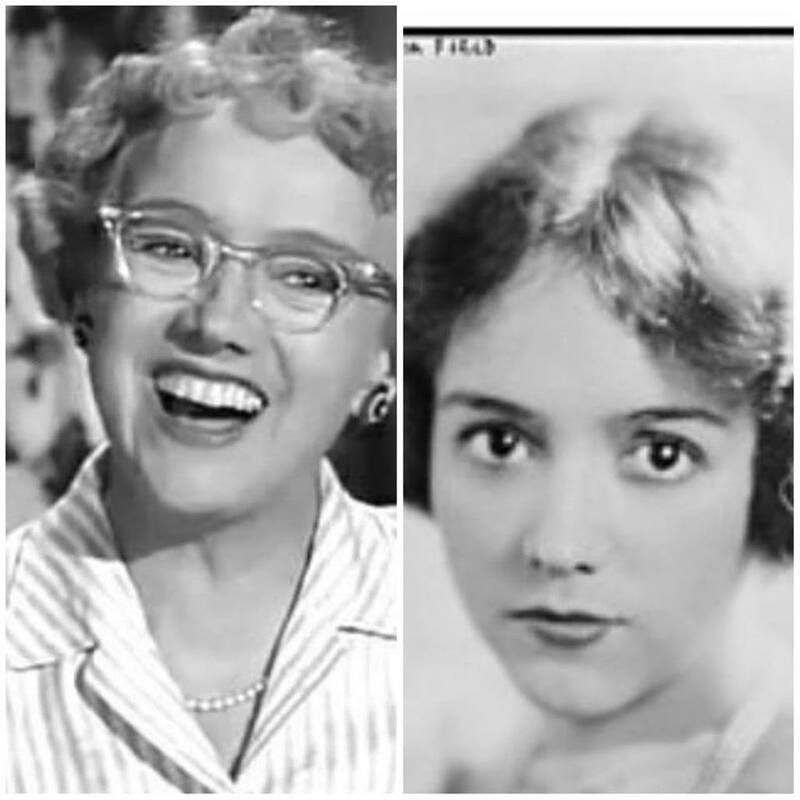 Her name was Sylvia Field, and when I saw pictures of her in the 1950s playing "Good old Mrs Wilson," I was enchanted to see what a lovely young Broadway star she was in the 1920s. 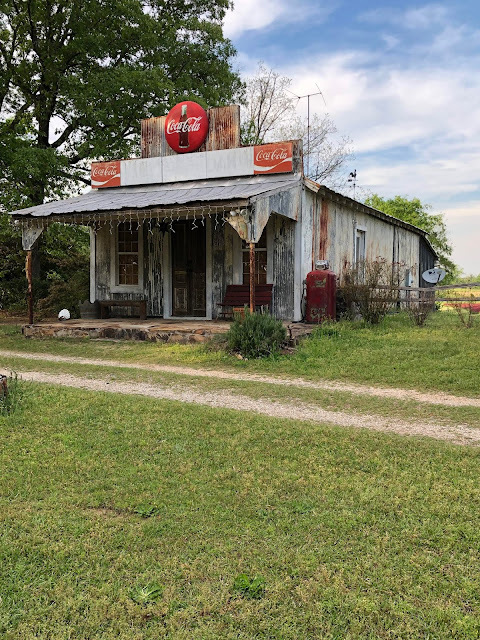 There's just something fun about thinking about all the stories that took place long ago in now-abandoned gas stations, such as this one in Pine Mountain, Alabama. "I'm completely satisfied with the way life seems to be working out"
Who would say that thing about a dinosaur? No surprise, it was spoken in the Hillsborough section of San Francisco, by Florence Fang, a woman who owns a house out there that was built in 1976. She paid $2.8 million for it two years ago, and there is a big brouhaha about the appearance of the place. What's wrong, you ask? Well, for one thing, it has orange and purple domes. 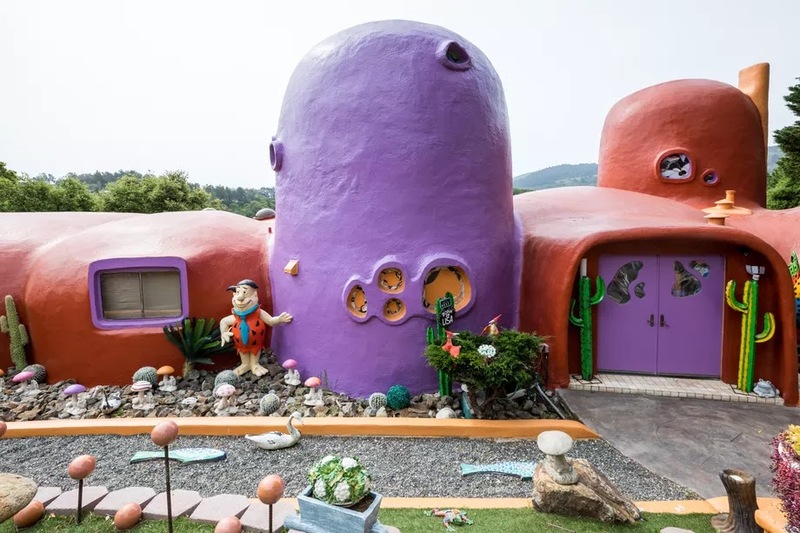 For another, it's a re-creation of the house once lived in by Fred and Wilma Flintstone. The neighbors and the city have been all up in Fang's grille about the place making the whole neighborhood look Bedrocky. Fang has hired an attorney, Angela Alioto (a former member of the Board of Supervisors and onetime candidate for mayor of San Francisco), and it's Ms Alioto's stance that they're coming after Fang mainly because of racist animus. Ms Fang is Asian. To bolster the claim of racism, Alioto says city officials spoke in a belittling manner and demanded that Fang "speak English." “The American spirit is you dare to make innovation,” says Fang, who says that people from all over the world write to her to praise her bold spirit. Many of these writers are children. The suit that the city filed against Fang centers around her changes to the property, not the house itself. But she has added enormous dinosaur statues, figures of Flintstones characters, giant painted mushrooms, benches shaped like pigs, Bigfoot, and a tableau showing a UFO and the aliens that came with it. Certain weight might be given to Alioto's theory of racism since no one complained about the Rubble around her house until Fang moved it, after which the city declared the decorations are a public nuisance. As Sgt Hulka said to Frances Sawyer in "Stripes," "Lighten up, Francis!" There was a time when we saw something we wanted a picture of - a sunset, kids on the beach, Lyndon Johnson showing his gall bladder surgery scars- and we grabbed the old Kodak Instamatic, snapped a snapshot or two, and then took the film to the drugstore for processing. And we waited, and waited, to get the prints back. The middle of next week, someone stopped off at Drugs-So-Lo and picked up the 4 x 6 pictures, and then we took them home, sent one in the mail to Aunt Gladys in Kankakee, and put the others in a shoebox. Now, we all carry a wonderful camera right in our hand, with a smart phone. It's too bad the qualities of being "smart" don't necessarily rub off on the smart phone user, but it seems that the phones are a lot smarter than we. The most recent tragedy occurred last weekend, when Sydney Monfries, 22, a senior at Fordham University just weeks short of graduation, fell 30 feet in the bell tower of the school, landing at the bottom of a stairway in a horrible, sad, death. She actually fell through an opening in a stairway landing at Keating Hall, plunging down the inside of the clockworks. The tower is supposed to be locked at all times and is strictly off-limits to students, who are told from day one at Fordham to stay away, but, according to the student newspaper, The Observer, climbing the tower is a "rite of passage" for seniors. Why was Monfries up there? Early on Sunday, just before her fatal fall, she was posting video of the great view of New York to Snapchat. There have been several fatal falls among tourists at the Grand Canyon this year, people who leaned over just a bit too far to get that perfect picture. I hope these warnings don't fall on deaf ears, but there is no Snapchat, no Instagram, no picture or video whatsoever that is worth risking your life to get. Ms Monfries was set to receive her degree and start law school in the fall, and now she is gone for not a very good reason at all, unless her loss is enough warning to save others. And you can bet that Fordham will install a new security system on that bell tower, just three months or so too late. The Maryland Lottery used to have a commercial jingle that said, "You gotta play to win." I mean, for all I know, that's still their jingle. I tune it out because the whole lottery thing just never worked for me. I have bought tickets from time to time, and I wanna tell you, if there were a prize for having the FEWEST matching numbers, I'd be a millionaire. I'm so lottery-unlucky, sometimes my ticket has letters, instead of numbers. And they spell out SORRY PAL. So don't take me to the Farm Store when you're getting in line for your lottos or scratchers. Instead, find this guy. Somewhere in Maryland there is a 75-year-old man who just pulled in $20,000 on a scratch-off ticket. And seven years ago, he won $30,000 the same way. The man told the lottery officials that he bought three "$250,000 Rich" scratch-offs at Downtown Tobacco in Lexington Market, and all of them were duds. So he dug a little deeper and bought a fourth ticket, and Bingo! "I just really like scratch-offs," the man said. 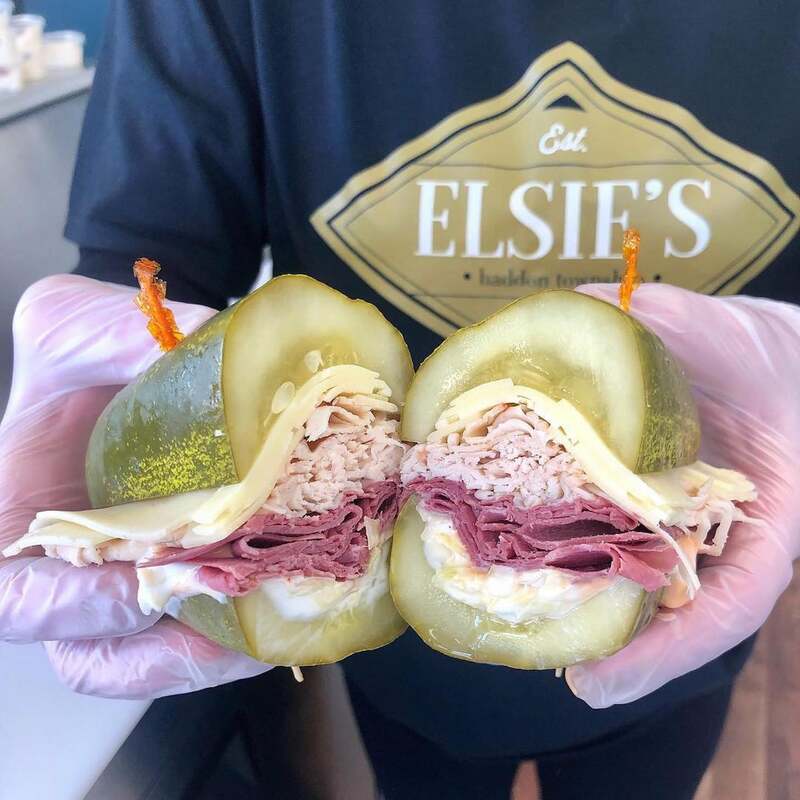 "I try to get a few every time I'm out." The man (the news story I saw did not mention his name) plans to share his loot with his family, and save the rest. Now, a lot of people would tell him to save that money! At 75, he should plan to live to be 95, and set something aside for rainy days. And I would tell him he can plan to win three or four more times in the next twenty years, so live a little! You can still get paint-by-number sets on Amazon and at real stores, but the man who invented that art delivery system and set off a national craze has passed away. His name was Dan Robbins, and he spent years Baskin' in the glow of his success. 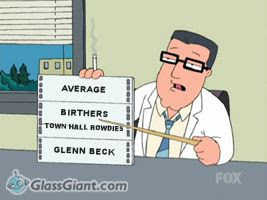 (I wish to have that pun stricken from the record, your honor). 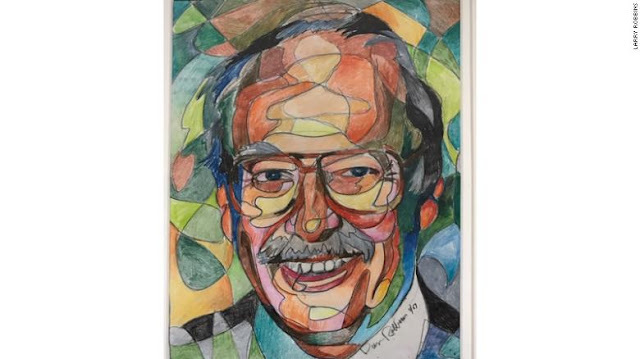 Robbins was working for the Palmer Paint Company as a package designer and graphic artist out in Detroit in the late 1940s. His boss came to him asking for ideas about how to sell more paint, as bosses will. Palmer Paint specialized in washable paints for children, but Dan figured that there was an adult market in helping people find painting fun. And he knew that Leonardo da Vinci had used a system of outlines on canvas, given to apprentices with instructions to fill in the outlines with colors. 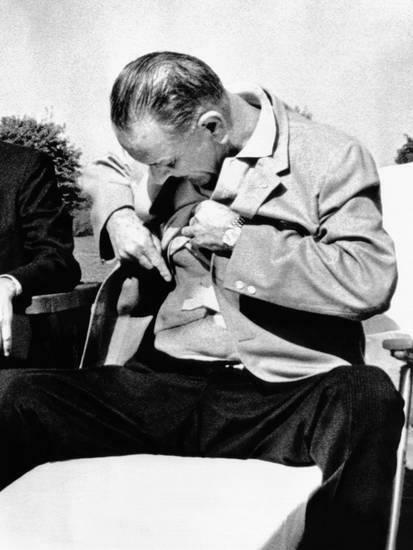 The idea came along at the right time, because after World War II, Americans, tired of fighting and conflict, turned to hobbies such as home decorating, woodworking, procreating, and art. Before the war, there was no time for leisure time, as everyone was too busy churning their own butter, making shirts from old flour sacks, and walking seven miles through mounds of snow to get to school (according to what we heard as kids in the 50s). But oh man, the 50s were big for paint-by-number! And people started wearing smocks and berets and really getting into it, and dens and living rooms across the nation were festooned with the little masterpieces as soon as the paint dried. and hang it up on the den wall. I'm no artist, but it seemed like the paint version of Mad Libs, that party favorite where you toss in a word as directed and everyone laughs. But no one thinks the people who play Mad Libs are "writing" anything, and it never seemed to me that paint-by-number pictures of wagon wheels propped up against a cactus, or a Vermont town with a church steeple towering over everything, or a fishing boat setting sail for a day of fun out on the bay were really art. 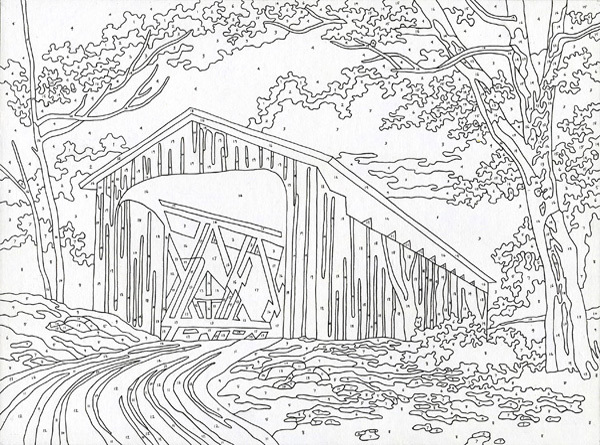 What's really sad is that Robbins (pictured above in paint-by-number glory) didn't even get rich from his invention, because he didn't own the paint company, or Craft Master, the parent corporation to Palmer Paint. That's where the money went. And Craft Master was sold to General Mills, purveyors of Cheerios, Cinnamon Toast Crunch, and Frosted Lucky Charms. Seems to me he deserved better. Let me take you for a walk, down to the corner of Nostalgia Lane and Superstition Street. The Seattle Mariners were a brand new major league ballclub in 1977, a team assembled from castoffs and unwanted players from the other teams...immortals such as Puchy Delgado, Carlos Lopez (who, as an Oriole in 1976, was hit on the head by a fly ball he was attempting to catch in right field) and Doc Medich, a pitcher who was also a medical doctor. The Mariners chose him because they knew Lopez would need neurological examinations from time to time. 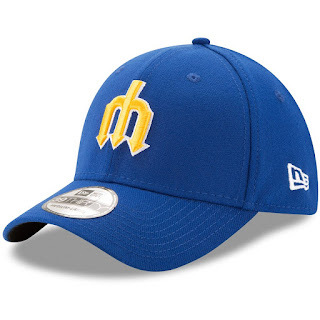 Seattle being out there by the Pacific Ocean, the team's cap logo combined an M for Mariners and the trident, the weapon used by the Greek God of the Sea, Poseidon. According to mythology, Poseidon had many adventures while spear fishing with his mighty trident, and the connotation of the sea weapon and the M was supposed to imbue the nascent ballclub with power. But of course, that didn't happen, and the Mariners continued to be a last-place team for several years. They were sold to a real Greek, George Argyros, a shipping magnate and philanthropist, in 1981, but Argyros knew that the upside down trident carried with it the association of the devil and his pitchfork, so he had the cap logo changed. And then the Mariners got to be a pretty good team, winning the American League Division Championship in 1995 and setting a league record for most wins by a team in one season (116) in 2001. They remain, though, one of seven major league teams that never has won a World Series, and in fact, they are one of two teams never to PLAY in the Series (the Washington Nationals are the other). In recent years, baseball teams all tend to have several different changes of uniform for each game, with batting practice jerseys and caps different from their game jerseys and hats. The Mariners brought back that trident logo two years ago - and the team suddenly was beset by injury after injury. And the superstitious blamed the hats. They changed the batting practice hats for this year, and so far in this early part of the season, the Mariners are leading their division. I got the idea for this from Todd Radom's excellent blog "Twelve ballcaps, twelve stories." Check it out! Isn't there some beach in Hawaii with black sand where it is forbidden to take even a souvenir bottle of sand home with you? I've never been to Hawaii, but I kinda like the music. 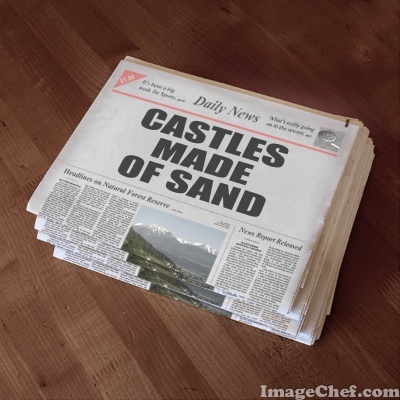 Don't need black sand, either. I guess some people just like to have a souvenir (the word is French for "remember") of places they've been and people they've been with. A tiny Statue of Liberty makes a fine decoration for any library, and a coconut shaved and shorn to look like a shrunken head is a sure conversation starter for when the in-laws drop over and won't leave. Deep in the heart of Texas there is a park called Enchanted Rock. Wonderful things are supposed to happen there, mystical things, things that cannot be explained by your science. "We've had Native Americans living here for over 11,000 years, so, of course there's some legends of the mystical powers of Enchanted Rock," is how Doug Cochran, park superintendent at Enchanted Rock State Natural Area puts it. That must be why a park visitor, a woman named Maria, walked off with this little rock in her hot little hand not long ago, and we can only surmise that she expected to a) win the Megaball Lotto b) come into a fortune such as that left behind by fleeing Nigerian princes whose nephews want to share it with you and c) establish an adult relationship with Matthew McConnaughey. 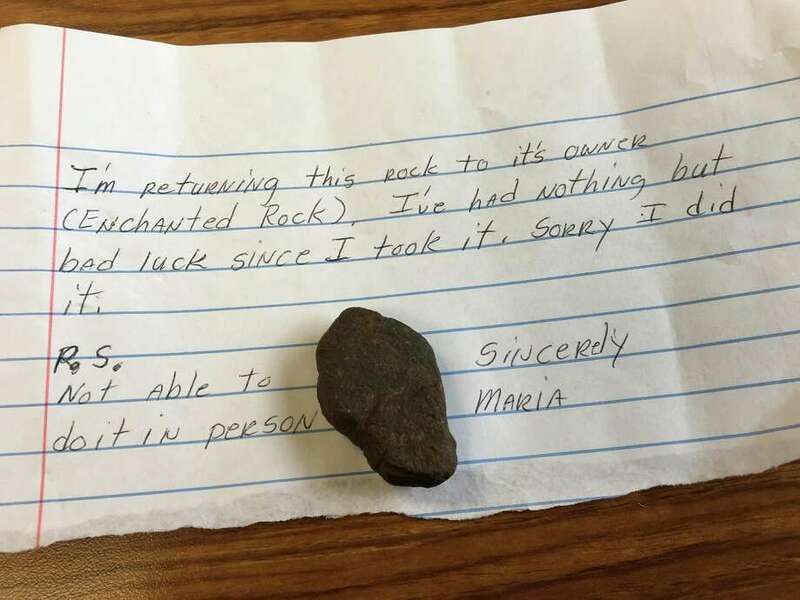 And it didn't work out, and perhaps Maria felt that the act of purloining that rock was what brought out the negative juju on her, keeping her away from the lotto, the Nigerian loot, and McConnaughey. All right, all right, all right. “I'm returning this rock to its owner, Enchanted Rock. I've had nothing but bad luck since I took it. Sorry I did it. P.S. not able to do it in person." Texas Parks and Wildlife spokesperson Stephanie Garcia said, "It's definitely unusual. It's one of those stories that are probably going to stick around with us for a while." Because who doesn't enjoy getting rocks in the mail? But Mr Cochran seems to think there is still some untapped magic in that stone. "We’re going to put it in a very special place where nobody knows it except me and one other person," he promises. We talked before about the old fireman I knew who carried a horse chestnut in his pocket for the purpose of "drawing out the rheumatiz'." Do you believe in carrying around amulets or talismans to bring you better luck, or health, or love? Do you believe it might be time to believe? I have been married since 1973, and that alone is the happiest aspect of my life. My wife is the most wonderful woman in the world, the best friend I shall ever know, and the true light of my world.